In all my years of blogging about Portugal, I’ve neglected to tell you about the many things to do in Coimbra. This pretty riverside city, presided over by a UNESCO Word Heritage university, has a fascinating history that visibly dates back to Roman times. As the first place I lived in Portugal and the closest city to where I currently live, Coimbra is also very dear to my heart. Many visitors don’t allocate enough time in their Portugal itinerary to really do the city justice. There are plenty of Coimbra sights and attractions to keep you occupied for at least a couple of days, not to mention the many day trips from Coimbra you could do if you use it as a base. If you are still planning your Portugal trip and can allocate more time to explore this part of Central Portugal, check out my recommendations for where to stay in Coimbra. Of all the gardens in Coimbra, the botanical gardens belonging to the university are the by far the biggest and best. Founded in the 18th century, the gardens contain several treasures, especially now that the path connecting the upper gardens with the lower gate is now open. You can either walk or take a bus if the hill is too much for you. On the upper level, you’ve got Lime Tree Avenue, a freshly renovated greenhouse, a gigantic strangler fig and a delightful landscaped area surrounding the ornamental fountain. If you head downhill from here, there are a few little detours from the main path that lead to a bamboo grove, the city cistern and parts of the original city walls. Not far from the Botanical Gardens (on Av. Marnoco e Sousa) there’s a rocky garden clinging to the hillside with fantastic views over Coimbra and the distant hills. Originally known as Stone of the Winds, this is where the heartbroken King Pedro would come to weep following the murder of his beloved Inês. 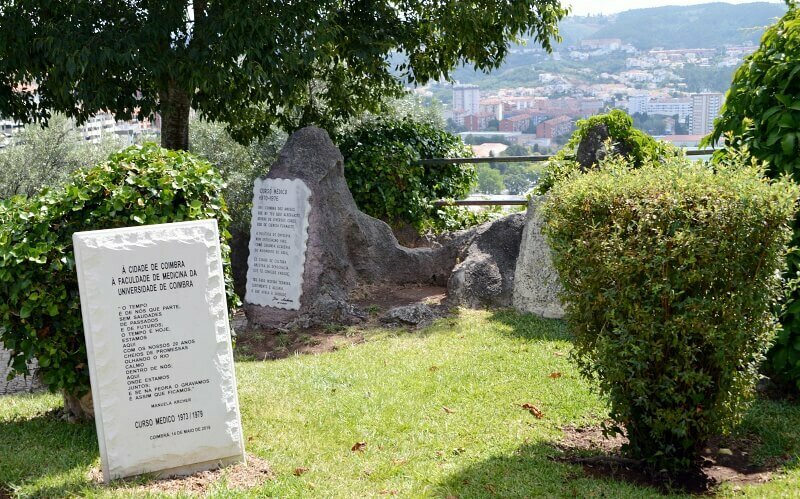 During the 20th century, the gardens became the haunt of academics and alumni who come here for student reunions and leave their mark in the form of poems dedicated to Coimbra, and especially its university, inscribed into stone tablets. When I first moved to Coimbra, the iconic giant green bear in Parque Verde was still in relatively good shape. A decade of children (and adults) climbing on its legs for photos have taken their toll and he looks rather shabby now. The grassy riverside park is still popular with families – you can rent bikes and pedal carts as well as pedaloes. Better still, take a stroll across the colourful glass-sided Pedro and Inês bridge for great views of Coimbra and the Mondego River. I’ve always been fonder of the prettier Manuel Braga Park with its riverside avenue of plane trees and little flower beds. 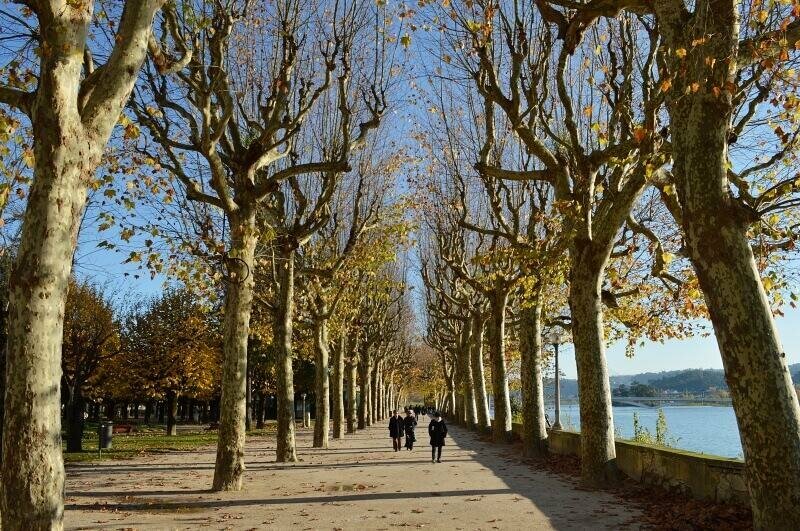 Sit in one of the love seats to watch the fountain in the river or stroll in the shade of the plane trees. The small Museu Da Agua often has temporary art exhibitions and the annual craft and book fair is held here each June. Tip: When the museum is open, you can buy a drink from the vending machine and take it down to the lower level and through the tunnel to a ‘secret’ platform overhanging the river. The gardens surrounding what was once a royal palace and now Coimbra’s only 5-star hotel tell a heartbreaking story of star-crossed lovers. I’ve mentioned Pedro and Inês more than once in this article. 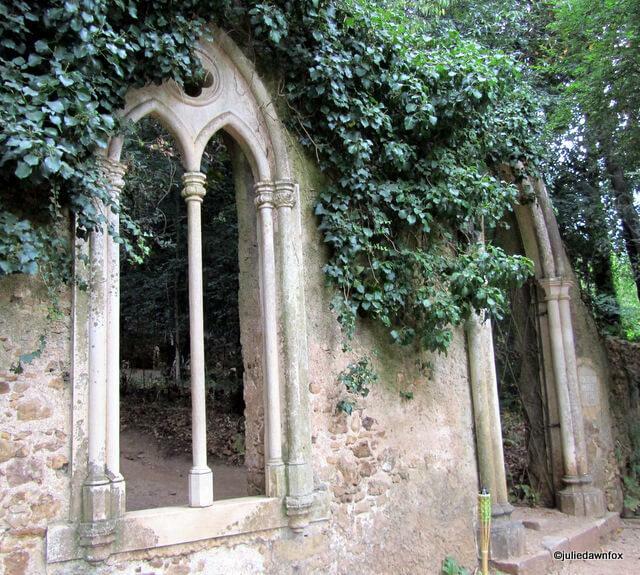 The follies and features within the grounds pay tribute to the intense romance between Prince Pedro and his wife’s handmaiden, Inês de Castro – more on that story in this post. While there are some exotic trees and attractive spots, you’ll get more out of visiting these gardens if you take a guided tour. You can get 5% off the Riverside and Tales of Love tour by GoWalks, or any of their Coimbra tours, by mentioning my code: JULIE5 when booking. 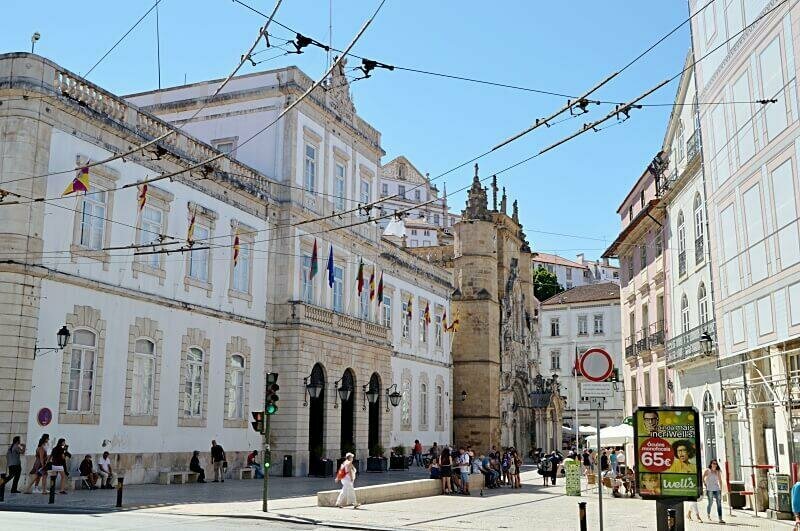 If you visit Coimbra, it would be a shame to miss the university. The first such institution in Portugal, the oldest part of Coimbra University occupies the former Royal Palace on top of the city’s highest hill. 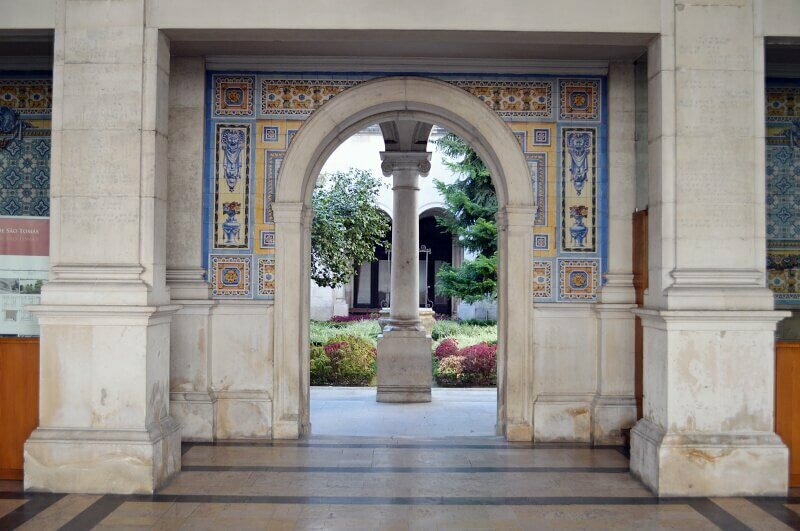 Even if you don’t pay to visit the beautiful Joanine Library or other special rooms, you can still enjoy the views over the Mondego river from Patio das Escolas and admire the hand-painted tiled walls of some of the university corridors for free. 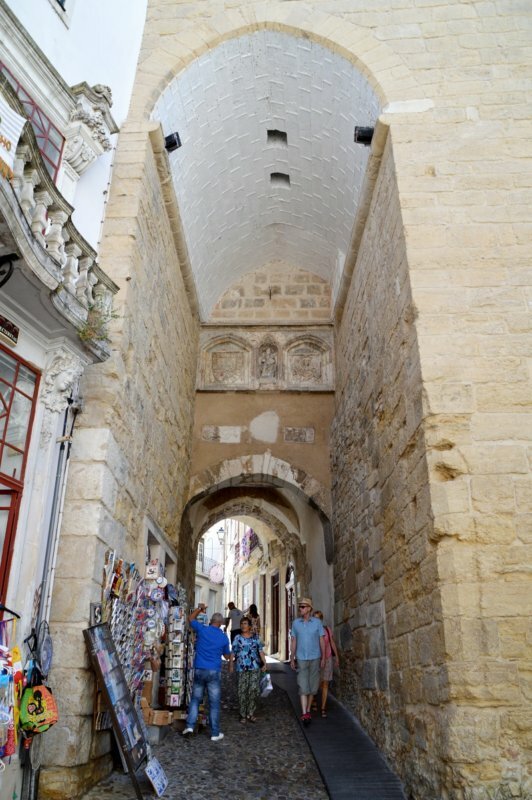 Insider tip: It’s less taxing on the legs if you walk up to the university alongside the 16th century São Sebastião aqueduct instead of the monumental staircase on Rua Oliveira Matos. 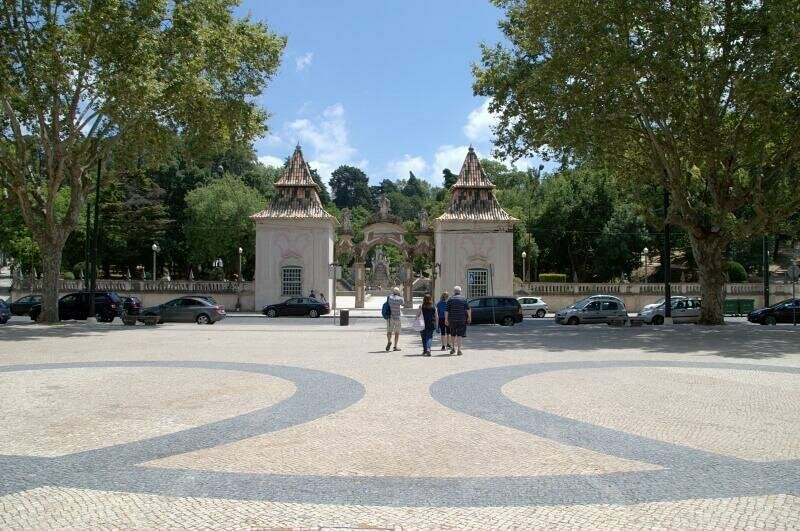 Once you’ve made it to the top of the hill, go past the more modern faculties towards Porta Férrea, the fancy stone gateway which is the entrance to Paço das Escolas. Coimbra University outgrew its original space so when Portuguese monasteries were abolished in 1834, several of the convents along Rua Sofia were taken over by the university. 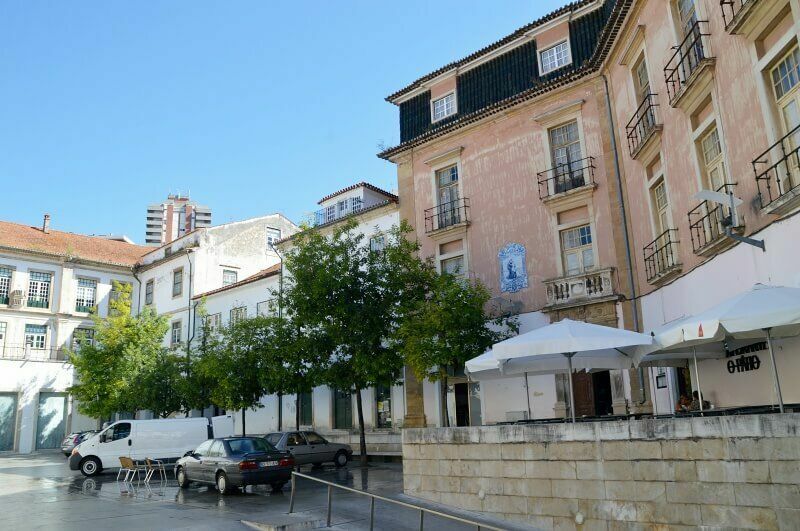 On the way downhill from the university to this impressive street, you’ll also pass the 12th century Sé Velha Cathedral, the 16th century Sub Ripas Palace with its Manueline doorway and the 12th century Santa Cruz church and historical. The abundance of such historically significant buildings qualifies the area for World Heritage status. Repúblicas originated in the 14th century in Coimbra when King Dinis I ordered houses to be built in the citadel of Coimbra castle to house students and the “good men” of the city. 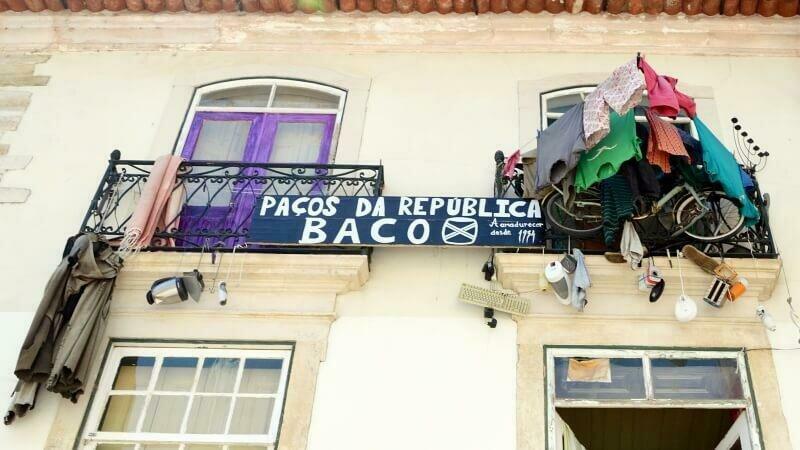 More than 20 Repúblicas still function today as communal student houses run by the students themselves with their own rules and regulations. You’ll spot them by their signs and quirky decor. The large square at the top of the leafy Avenida Sá da Bandeira is surrounded by cafés and bars. Just down the road from the university, it’s popular with students both day and night. During freshers’ week and other academic festivities, you’ll likely encounter groups of caped scholars here. As museums go, I think this one is quite special. 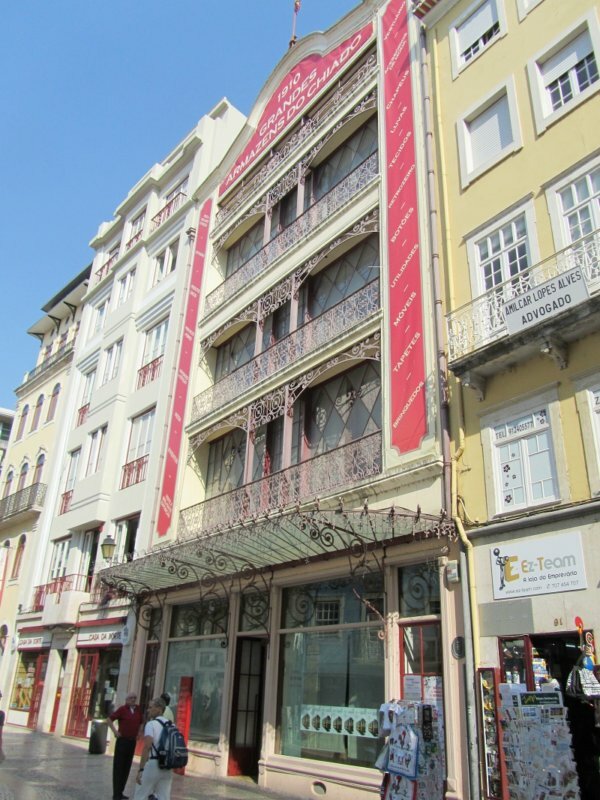 Coimbra’s Machado de Castro National Museum reopened in 2012 after extensive remodelling. Beneath the modern museum space lie the cool dark tunnels of a 2000-year-old Roman cryptoportico. The ground floor hosts an impressive display of stone sculptures from the Coimbra region dating from the 11th to the 18th century. Downstairs, there are more sculptures, this time of wood and terracotta. The upper floors hold some remarkable gold jewellery and somewhat creepy religious relics, a large collection of religious oil paintings and some interesting ceramics and furniture. Allow at least a couple of hours to explore all four levels. There’s a café and restaurant with fantastic views over the old cathedral and the river if you need to refuel during your visit. Museu Nacional Machado de Castro is on the corner of Rua São João and Rua do Norte, opposite Largo de Sé Nova. Opening hours: October to March 10:00 to 12:30 and 14:00 to 18:00, April to September 10:00 to 18:00. 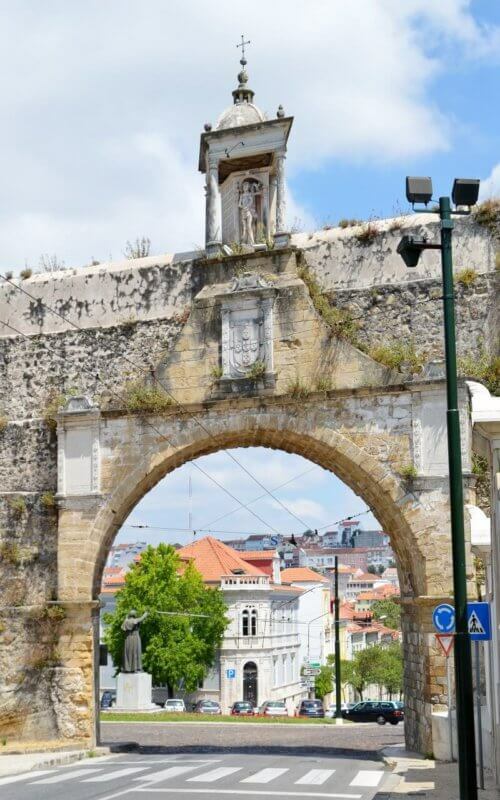 You can see fragments of Coimbra’s original city walls in various parts of the historical centre. To find out more about them, head to the Núcleo da Cidade Muralhada (Walled City Centre). For a couple of euros, you get to see a short film (in various languages so wait for one you understand) and a model showing how the walls protected the city and where you can see what remains of them. You can then walk around the Almedina Gate tower for fantastic views over Coimbra and a scary view of the street below through a section of glass floor. One room explains the history of the royal palace which was transformed into the university in the 16th century. Open Tuesday to Saturday from 10 am to 1 pm and 2-6 pm. As you walk along the main shopping street in downtown Coimbra, look out for the frilly metal decorating the exterior of Edificio Chiado. The lower floor of this former department store is dedicated to temporary exhibitions which are free to enter. The upper two floors only cost a couple of euros to access and are worth it if you have time. The space is rather cramped for the number of paintings on display but there is a wide range with some really nice pieces. The upper floor also has some period furniture and ceramics from China and Portugal. Rua Ferreira Borges 85. Open Tuesday to Sunday from 10 am to 6 pm (closed for lunch between 1 and 2 pm on Saturdays and Sunday). Opposite the botanical gardens and just before the Arcos de São Sebastião is a house that belonged to university professor, doctor and philanthropist, Fernando Bissayo Barreto. The high white wall around the house conceals a surprising garden full of sculptures and azulejos (painted tiles). Even if you don’t want to go inside the house museum, you can simply take a look at the artwork in the grounds. 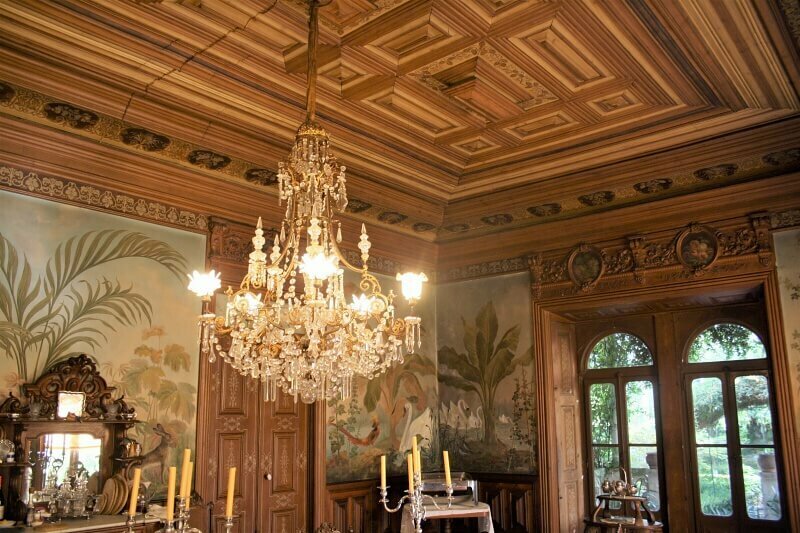 The furnished interior has been preserved so that you can see how a prominent figure in Portuguese society used to live. Some of the rooms are used to host temporary exhibitions and other cultural events. See the website for opening times and agenda. When I first arrived in Coimbra in 2007, work was still underway to dig this 14th century monastery out from under the mud accumulated over centuries of flooding. By 2009, the golden sandstone had been cleaned up, a new museum opened and walkways between that and the ancient building created. The Gothic structure is partly in ruins but sturdy enough to host concerts and events and it’s a pleasure to walk around. Just don’t choose the hottest day of the year like Mike and I did otherwise you’ll get scorched as you walk across the grounds. When we visited the museum, they had a sadly temporary exhibition of the archaeological findings from the Poor Clare nun’s convent and cemetery. It was fascinating to see how much information about their lifestyles and changes in society could be gleaned from studying their teeth. The permanent exhibitions contains other artefacts and delves into medieval medicines and illnesses as well as religious art and architectural subjects. The museum also has a pleasant café with a daily lunch special and decent salads. Open Tuesday to Sunday from 10 am to 5 pm. Tip: The entrance is not where you might expect it to be. You need to head for the modern museum building, accessed via Rua Parreiras, rather than the ancient church. The Saint Sebastian aqueduct, better known locally as Arcos do Jardim, was built in the 16th century over the remains of a primitive Roman aqueduct. It supplied water to the castle at the top of the hill and other parts of the upper city, also known as Alta. If you follow the arches uphill, they’ll take you alongside the botanical gardens to the university. From the botanical gardens side you should be able to see a statue of St. Sebastian in the niche above the first arch. Unlike the Bissaya Barreto house, the family that own Casa Costa Lobo have been living in their medieval home for 5 generations and are now welcoming visitors for tea and cake. One of the twin sisters will take you on a guided tour of their house and proudly share their family’s history, especially that of their illustrious ancestors including renowned astrophysicist, Francisco Miranda da Costa Lobo. They also explain how family symbols were weaved into the very decor of each room when they were designed by acclaimed scenographer Pereira Cão in the 19th century. He lived in the house for 3 years, using the first of those to get to know the family and conceive his designs for decorating their home. The visit ends with refreshments in the family living room or in the garden if the weather permits. The wall opposite the Municipal Market gives you an overview of Coimbra’s historical buildings via a series of hand-painted tile panels. Not only are they pretty to look at, they’ll give you an idea of what you’ll see (or miss if you haven’t got time to visit them all!). Waiting for the wheels of justice to turn at the Palácio da Justiça is slightly more bearable thanks to the courtyard lines with painted tile panels depicting significant episodes and legends in Portuguese history. Open Monday to Friday from 9:30 to 12:30 and 1:30 to 4 pm. You may need to ask the security guard if you can just go in and take a look at the tiles. In need of a clean, the yellow domes and arches of Jardim da Manga have graced this space at the base of Rua Olímpio Nicolau Rui Fernandes since 1528. 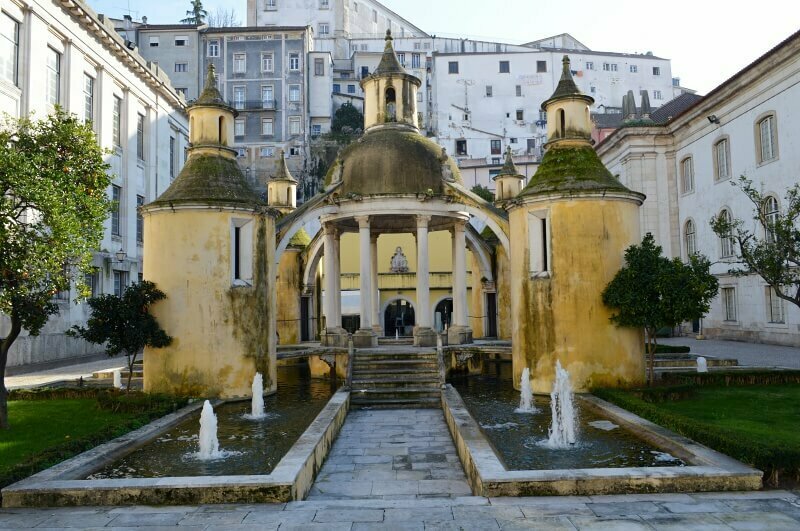 The first example of Renaissance architecture in Coimbra, this small garden and its central fountain was originally part of the cloisters of the Santa Cruz monastery. Manga is Portuguese for sleeve and the story goes that King João III sketched the design for the ornamental fountain on his sleeve during a visit to the monastery. This majestic cathedral, ensconced within the sprawl of medieval streets that cover the hillside, dates back to the very early days of Portugal as a country. 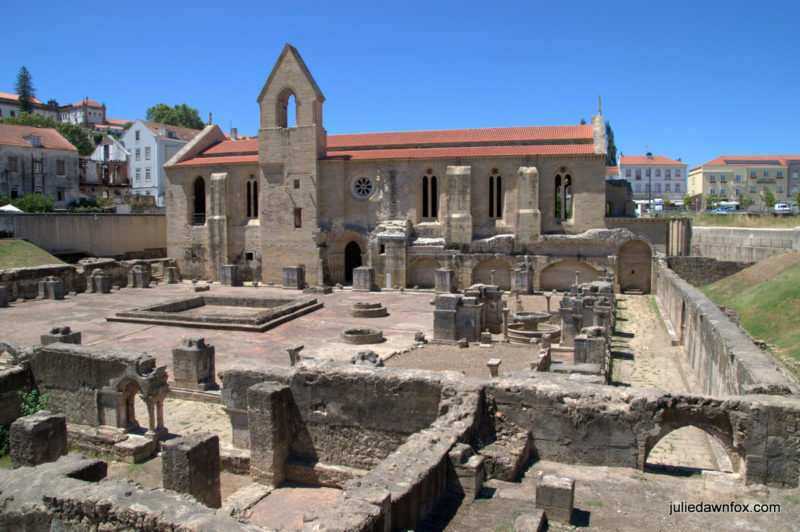 When the country’s first King, Afonso Henriques, made Coimbra his capital city in the 12th century, construction began on a befittingly impressive cathedral in the new Romanesque style. The carved stonework around the doorway is classical of this period while later additions in the 16th century led to ornate side doorways in the Renaissance style. Fortunately, the original structure was little altered during these renovations. It’s worth paying the small entrance fee (€2) to discover the beautiful Seville tiles and Gothic altarpiece inside. You’ll also find the tomb of Sisnando Davides, first Governor of Coimbra, in a rather dank chamber. This is another monument that dates back to the time of King Afonso Henriques, one of the two first kings of Portugal to be entombed here. Despite being outside the original city walls, Santa Cruz monastery was the most important such establishment in those days. You won’t find any evidence of its Romanesque origins thanks to the complete renovation ordered by King Manuel in the 16th century. The intricate sculptures around the church doorway have largely disintegrated over the years but it remains one of the city’s key attractions and is worth going inside to see the interior features and artwork. Once you’re done, pop next door to the Café Santa Cruz for refreshments in a medieval environment. I mentioned the tile panels opposite the market but of course the market itself is a great place to get a taste of local colour and culture. 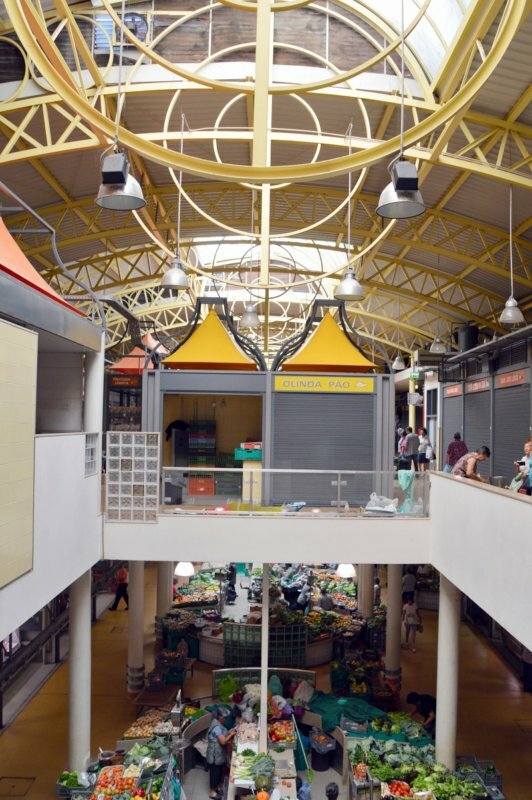 The market stalls are spread over 2 levels in an atrium-style building. Tip: It’s best to go in the morning while the fresh fish is still on display. After lunch, many stall holders pack up for the day. Rua Olímpio Nicolau Rui Fernandes. Open Monday to Saturday from 7 am to 7 pm. Although fado, Portugal’s haunting folk music, originated in the Alfama district of Lisbon, Coimbra developed its own version. Students from around the country brought their own musical traditions to their university city. Coupled with a trend for serenading sweethearts in the streets, Coimbra fado was born. Sung exclusively by men (there were no female students back in those days), usually sporting the black university cape, the lyrics are often about love, be it for a woman or university life, or political. 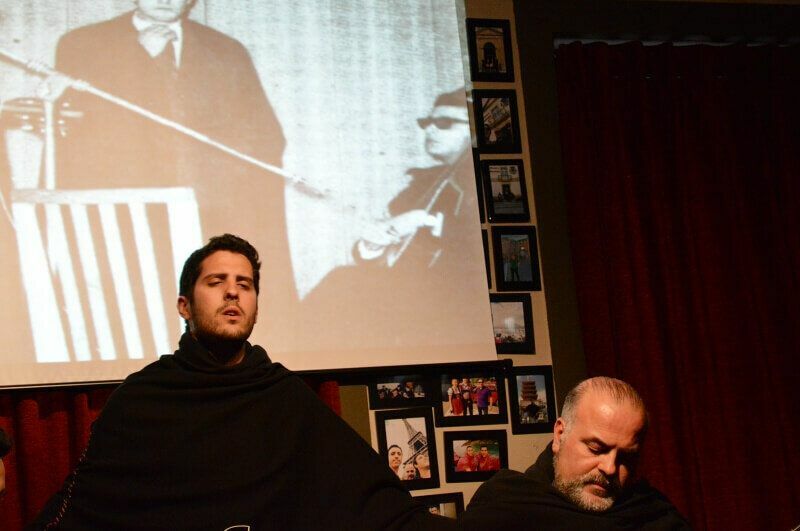 Fado ao Centro is run by passionate fadistas and offers daily performances at 6 pm which combine a brief history of the genre with live performances in an intimate setting. Book ahead as this venue is popular with visitors and local fado fans. Rua Quebra Costas 7. See the website for more details and online reservations. Although there are few obvious remnants of the chilling acts carried out by the Inquisition Court in the 16th century, this square was the headquarters of the Christian order charged with weeding out and punishing heretics and enemies of the church. Most of them were suspected Jews, likely denounced by their Christian neighbours. The uneven stone near the far corner of the square is thought to be the beheading block. If you go through the archway, you’ll see parts of the former jails that have been excavated. Other than that, you’ll need to use your imagination to reflect on it’s gory past. Unless you’re allergic to cats, it’s hard to resist the cute playful kittens at Coimbra’s cat café. The €5 you spend to gain access to the cat playroom gets you a drink and lots of furry snuggles. 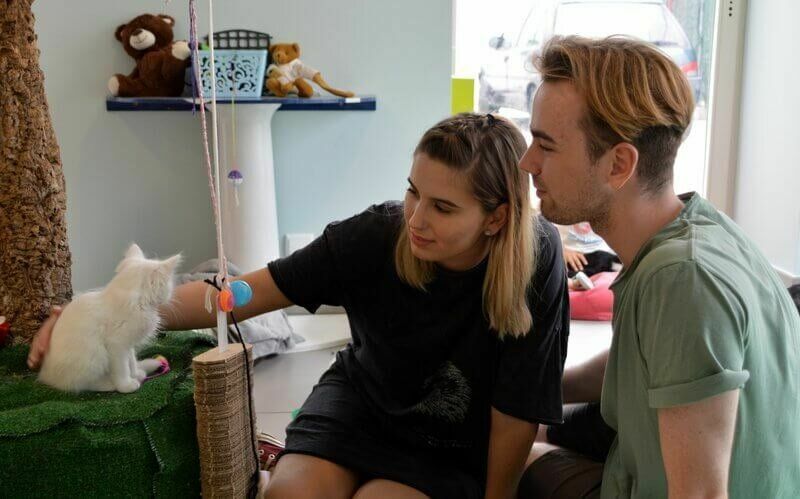 Not only do you get to enjoy the company of the resident felines, your money goes towards their care and treatment and that of other abandoned cats. If you live in Portugal, you could even adopt a cat or two. Rua João Cabreira, 4. Open 9 am-8 pm Mon-Fri, 10:30 am-8 pm Sat, closed Sundays. Note: My Coimbra tips for places to eat and drink are in this recently updated post. Coimbra is absolutely stunning. 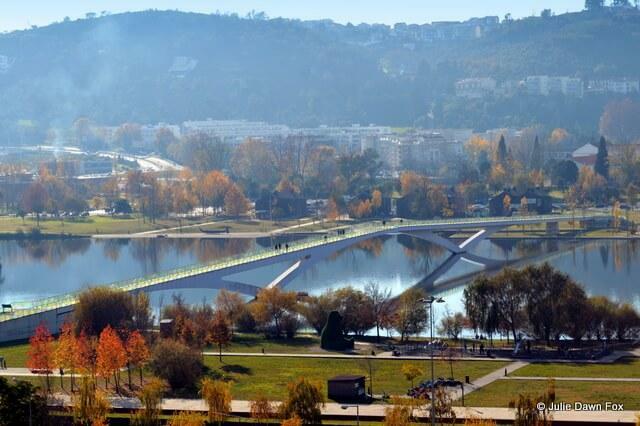 Why waste time in stressful and expensive cities like Lisbon and Porto when you have an incredible city like Coimbra? Hi Julie, Just found your blog and its looks very helpful. We are an ex-pat Brit and Brasilan couple living in the US and will be in Portugal for 8 nights at the end of September. We are driving from Lisbon to Porto and stopping in Coimbra for a few hours ( I know, not much time ). What do you recommend for 3 hours ? P.S My wife speaks Brasilian Portuguese and I have a smattering from my 6 months is Lisbon in 1986. . Thanks for sharing these all interesting things to do in Coimbra. This is a really nice post and great information. 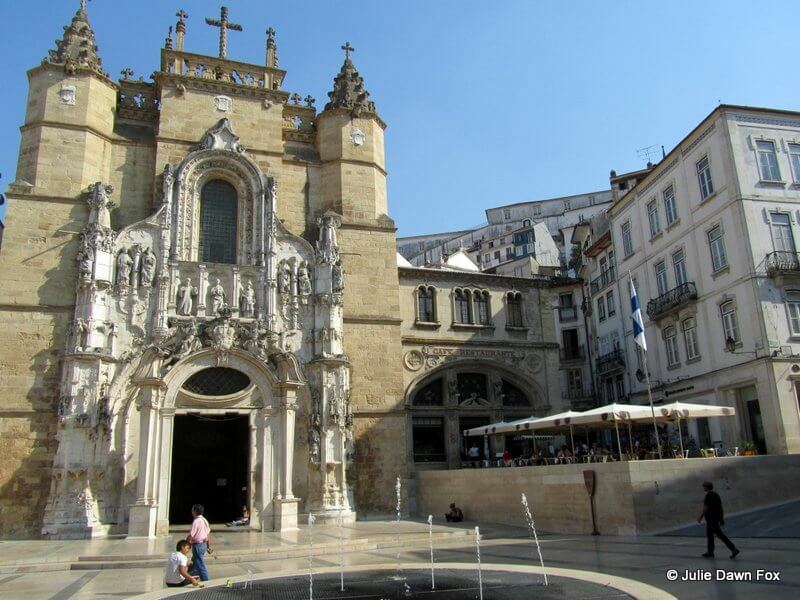 Coimbra is a historic city and has several famous landmarks of interest to the visitor. The most famous is the old university. Many fine textiles and linens sold in the U.S. are made in Portugal. Are there factory outlets that could rationalize a trip? Also, how about shopping tours for smart prices? I would think these would be popular. Thanks. Hi Clare, I’m not a big shopper and therefore not really in a position to advise on this. Wow! Have I missed out or what! Been there several times but never knew there was so much to see and do. Then again, there is so much to experience in Portugal in general that an aging traveler must be discerning regarding the relentless march of Father Time. Hi Frank. You’re not alone but hopefully you will be able to enjoy some of these things on your next visit.